Film Review: Raise the Titanic – I Love Disaster Movies! 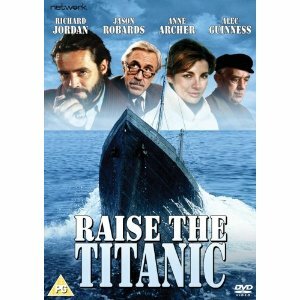 Whilst not technically a real disaster movie, “Raise the Titanic” falls into a strange category of film. It’s an action, adventure, drama based on a real disaster but without really dealing with any of the above. In what is a very confused film, there is little enjoyment to be had. Full steam ahead with the review then! In the name of America (hallelujah!) a new mineral is discovered that could revolutionize defense systems and it can only be found in one place in the entire world – the sunken Titanic. That’s going to be one hell of a rucksack to carry that over your shoulder. It’s time to raise the beast! Drownings, implosions, a lot of murky camera work and generally being anywhere near any of the leading characters as they’re all as likeable as athletes foot. Based from a Novel that I’ve never read, Raise the Titanic had a whopping $36 million budget. That’s three times the size of The Towering Inferno. The question I ask is where did it all go? In film of two distinct halves, the first is devoted to setting up several characters who will form part of the group to Raise the poor boat from the water. Interestingly Anne Archer and Alec Guiness are not in that team and simply feature for a couple of scenes. Why they are splattered all over the cover arts I’ve no idea. However, what all the characters also have in common is that none of them are likable in the slightest. The script and actors are overwrought with angst dialogue as everyone tries to show they’ve got bigger balls than the rest to the point where it becomes aggravating. A love triangles introduced only to be dropped unresolved half way. Everyone suddenly decides to work together bang on the half way mark. It’s like the directors had a tick sheet of what they felt needed to be shoved into a movie and then crammed it all in without rhyme or reason. However while so much emphasis is given to all these unlikable characters, very little is given to the real star of the show itself – the Titanic. The best and most coherent moments in the film are about the ship itself and even though it’s factually incorrect, the model itself is impressive – but never exploited. It’s all about the mineral and that’s where the film goes so very wrong for me. If everyone disregards the huge scale of that event if it were to ever happen as they do in the movie, it makes everyone seem like tasteless jerks. As a result I couldn’t care for the plot, the characters or the conclusion. The model used for the Titanic was the biggest model used ever at that time and it looks good even if time hasn’t been massively kind to the effects. Where I assume the budget went was in the underwater photography which is eerie and beautiful at the same time. Some of it is very murky but then that’s what I’d expect. The submersible scenes are well executed too. The story is awful, the characters dull but the set piece of the raising itself is well done. Any Titanic interest can be found in the inaccuracies – some quite large. I was most interested in the film from this historical angle. As a film on its own merit, it doesn’t really do anything wrong – it’s just a jack of all trades and a master of none. No named characters die so the best death sequence is when a leaking sub implodes on itself. Rather nasty stuff! The Titanic itself. None of the humans are worthy of the vote. They are all that bad! The Titanic pops out of the Ocean with three masts and not one that it went down with. I was left frustrated at what could have been. Raise the Titanic appeared to miss the whole point of the film. Aside from the beginning montage of pictures and the actual docking scenes themselves, its like they could have raised a rubber dingy out the water and had the same reaction. Add in characters from hell and a general dullness across the board and Raise the Titanic is hard to recommend. For me, it’s only that long overhead SFX shot in the end credits and John Barry’s BEAUTIFUL score that are worth watching. In the book, the Titanic naturally gets smacked by an out-of-season, unusually-powerful typhoon (and naturally, there is much talk of the sea trying to claim its stolen prize yadda yadda). A team of Soviet commandos boards the Titanic during the storm while Dirk Pitt, our obnoxious hero, is thought to be swept overboard. Selby, waiting in New York, kept out of the loop, and fearing Titanic lost at sea, contemplates suicide. A passing cop, trying to talk him out of it, mentions reports of the Titanic’s survival and Selby’s thrilled…but when the Byzantium isn’t found in the vault, Selby has a complete breakdown. He decapitates the corpse found within before being dragged away kicking and screaming. The only other major change is the very end; the concept of the Byzantium Bomb is solely the film’s, and the missile defense system that required the Byzantium in the first place is tested successfully. So director Jerry Jameson (Airport ’77, Hurricane, A Fire in the Sky) and writers Eric Hughes and Adam Kennedy (The Domino Principle) actually carved out a huge dramatic action-filled climax in favor of subs poking around endlessly in the muck. They also clipped the opening chapter in which the Titanic goes down in favor of that artsy montage. BAH.